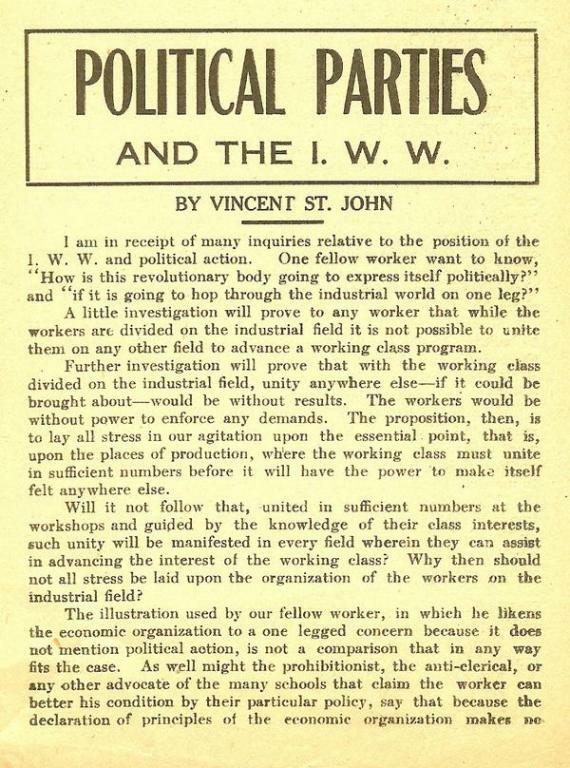 Vincent St. John on how the IWW views political parties. We are in receipt of many inquiries relative to the position of the I. W. W. and political action. One fellow worker wants to know, "How is this revolutionary body going to express itself politically?" and "if it is going to hop through the industrial world on one leg?" A little investigation will prove to any worker that while the workers are divided on the industrial field, it is not possible to unite them on any other field to advance a working class program. Further investigation will prove that with the working class divided on the industrial field, unity anywhere else—if it could be brought about—would be without results. The workers would be without power to enforce any demands. The proposition, then, is to lay stress in our agitation upon the essential point: that is, upon the places of production, where the working class must unite in sufficient numbers before it will have the power to make itself felt anywhere else. Will it not follow that: united in sufficient numbers in the workshops and guided by the knowledge of their class interests, such unity will be manifested in every field wherein they can assist in advancing the interest of the working class? Why, then, should not all stress be laid upon the organizations of the workers on the industrial field? The illustration used by our fellow worker in which he likens the economic organization to a one-legged concern because it does not mention political action, is not a comparison that in any way fits the case. As well might the prohibitionist, the anti-clerical, the K. K. K., or the Knights of Columbus, or any other advocate of the many schools that claim the worker can better his condition by their particular policy, say that because the declaration of principles of the economic organization makes no mention of these subjects the I. W. W. is short a leg on each count. The Preamble of the I. W. W. deals with the essential point upon which we know the workers will have to agree before they can accomplish anything for themselves. Regardless of what a wage worker may think on any other question, if he agrees upon the essential thing, we want him in the I. W. W. helping to build up the organized army of production. The two legs of the economic organization are KNOWLEDGE and ORGANIZATION. The only value that political activity has to the working class is from the standpoint of agitation and education. Its educational merit consists solely in proving to the workers its utter inefficacy to curb the power of the ruling class and therefore forcing the workers to rely on the organization of their class in the industries of the world. It is impossible for any one to be a part of the capitalist state and to use the machinery of the state in the interest of the workers. All they can do is to make the attempt, and be impeached—as they will be—and furnish object lessons to the workers, of the class character of the state. Examples wherein the workers have had to use their economic power to have the labor laws enacted are plentiful. The Buffalo Switchmen's strike of 1892 was for the enforcement of the ten-hour law. Time after time the Western Federation of Miners and the I. W. W. have gone on strike to make the employers recognize the mine safety laws, and in 1904 the W. F. of M. struck for the enforcement of the eight-hour day law that had been passed by the Colorado legislature and endorsed by a referendum of Colorado voters. Last year (1923) the I. W. W. had to strike in Bingham Canyon, Utah, to get the Utah laws observed. Economic action is the only way the La Folette seamen's bill can be even approximately observed, and at present in Mexico, our fellow workers are resorting to the strike off the job to make employers comply with 8-hour day and other labor provisions of the National Constitution. Laws that labor shall have this or that are passed to hoodwink Labor; they stay harmlessly on the books because the master knows he can beat any worker in the courts, and doesn't care what the law is. Knowing this, the I. W. W. proposes to devote all of its energy to building up the organization of the workers in the industries of the country and the world; to drilling and educating and disciplining the members so that they will have the necessary power and the knowledge and the organization to use that power to overthrow capitalism. We know that here you will say: What about the injunction, the militia and the bull pens? In answer, ask yourself what will stop the use of the same weapons against you on the political field if by the political activity of the workers you were able to menace the profits of the capitalist? If you think it cannot be done, turn to Colorado, where in 1904 two judges of the Supreme Court of that state, Campbell and Gabbert, by the injunction process, assumed original jurisdiction over the state election, and decided the majority of the state legislature, the governorship and the election of the United States Senator. Turn to the Coeur d'Alenes where the military forces of the United States put out of office all officials who would not do the bidding of the mining companies of that region. Turn to Colorado, where a mob did the same thing in the interest of the capitalist class. Turn to the case of the five New York Assemblymen, regularly elected by the Socialist party, and thrown out of office by the other Assemblymen because they were socialists, no other crime being even alleged against them. Turn to La Follette, with his seat contested in the Senate for telling the truth about the war, and only readmitted when he had made his peace with the plutocracy, and promised to be good. Consider that one regularly elected Congressman, Victor Berger, was actually denied his seat. Turn to the matter of Sid Hatfield, a labor chief of police: they didn't take the trouble to eject him legally from his office; they just killed him, and capitalism approved. The only power that the working class has is the power to produce wealth. The I. W. W. proposes to organize the workers to control the use of their labor so that they will be able to stop the production of wealth except upon terms dictated by the workers themselves. The capitalists' political power is exactly the measure of their industrial power—control of industry; that control can only be disputed and finally destroyed by an organization of the workers inside the industries—organized for the every day struggle with the capitalists and to carry on production when capitalism shall have been overthrown. With such an organization, knowing that an injury to one member of the working class is an injury to every member of that class, it will be possible to make the use of injunctions and the militia so costly that the capitalist will not use them. None of his industries would run except for such length of time as the workers needed to work in order to get in shape to renew the struggle. A stubborn slave will bring the most overbearing master to time. The capitalists cannot exterminate a real labor organization by fighting it; they are only dangerous when they commence to fraternizing with it. Neither can the capitalists and their tools exterminate the working class or any considerable portion of it; they would have to go to work themselves if they did. It is true that while the movement is weak they may victimize a few of its members, but if that does not intimidate the members of the organization the employers will not be able to do that very long. Persecution of any organization always results in the growth of the principle represented by that organization—if its members are men and women of courage. If they are not, there is no substitute that will insure victory. The I. W. W. will express itself politically in its general convention and the referendum of its members in the industries throughout the land, in proportion to its power. The work before us is to build up an organization of our class in the field wherein our power lies. That task must be accomplished by the workers themselves. Whatever obstacles are in the way must be overcome, however great they seem to be. Remember that the working class is a great class and its power is unbounded when properly organized, trained and disciplined. As we organize we control our labor power. As we control our labor power a little we control industry a little; as we organize more, we will also control industry more. When we control enough of our labor power we will meet in our representative assembly—the Convention of the I. W. W.—and tell the boss how long we will work and how much of what we produce he can have. The sooner all the members of the working class who agree with this program lend their efforts to bring it about—by joining the I. W. W.—the sooner will the class struggle be ended in spite of all the machinations of the capitalist and his judges and armies. Therefore it will never be necessary for the I. W. W. to endorse any political party, whether we will gain support or not by so doing. Neither will the I. W. W. carry on propaganda against political action. To do so would be as useless as to carry on a campaign for it. It should be remembered that the I. W. W. since 1908 has been non-political. We are forced, however, to point out the limitations of political actions for the working class in order that the workers be not led into a cul de sac by the politicians, and because they would lose all idea of ever being anything but wage slaves for generations to come. This we can only do by devoting our entire effort to the work of organization and education on the industrial field. To those who think the workers will have to be united in a political party, we say, you have a right to think so, but do not try to use the economic organization to further the aims of the political party. Experience teaches that to do so, will cause disruption. Taken from Jim Crutchfield's IWW Page. This is the 1924 edition, earlier editions exist.